A roast chicken is a weekly staple for the two of us. 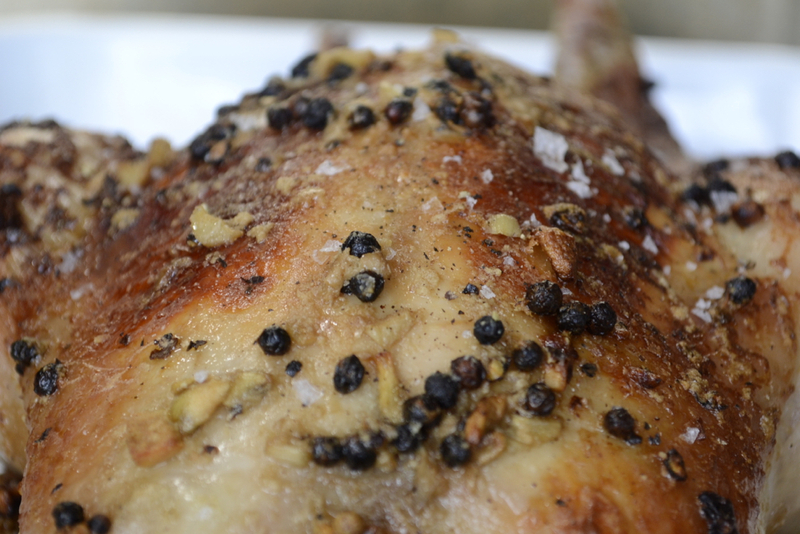 If we choose to have beef or pork for Sunday lunch, we’ll no doubt still get a whole chicken to have some point during the week – it’s so economical. You always get more than one meal out of it; leftovers are great for salads and lunches; thighs, wings and legs can be stripped of the meat and made into a variety of dishes; bones always equal fantastic stock. One chicken is the gift that just keeps giving – which we want to stress is why everyone needs to respect chicken and buy the best quality, highest welfare one you can afford (whatever your budget is). 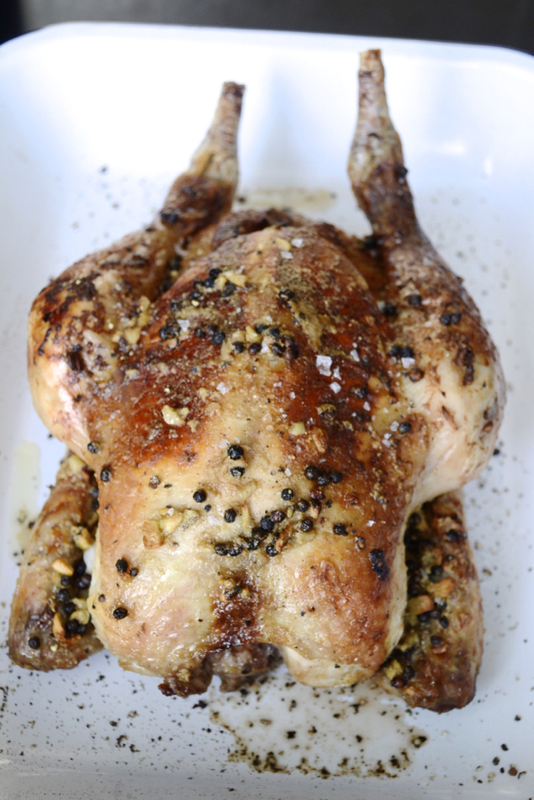 As Sunday approaches each week, we tend to box off Saturday as the one night where we wouldn’t ever have a roast chook. However, after making it a bit more Saturday friendly (ie. adding some spice, some carby sides, a hot, delicious sauce), we are simply in love with buttermilk chicken recipe we’ve devised with buttermilk as a marinade. Garlic and black pepper work so so well together. Some people find garlic a bit overpowering, only use a small amount when cooking. However, we find if you use a larger amount it doesn’t ramp up the ability to stave off vampires too much more. Black pepper, our base ingredient in virtually everything we cook, gives this a spicy kick and keeps – let’s face it, sometimes bland bird – everything well seasoned. 1. 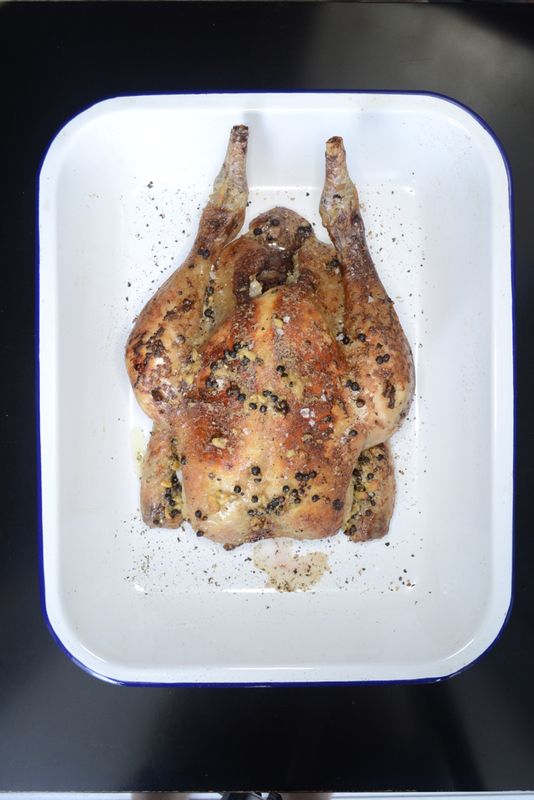 De-truss the chicken – it’s pretty cosmetic and doesn’t add anything to the cooking process. 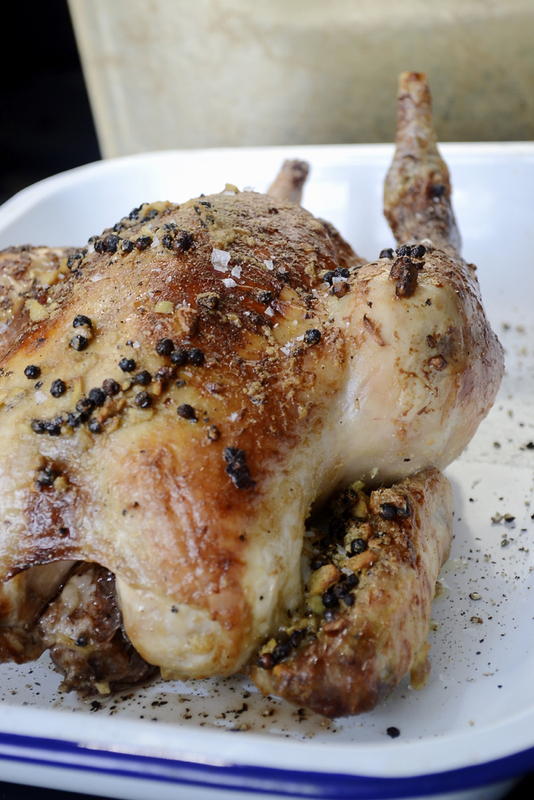 It also allows you to move all parts of the chicken while rubbing the flavouring into the bird. Loosen the skin from the breasts with your fingers. 2, Place your chopped garlic, peppercorns and a pinch of salt into a pestle and mortar and grind them until it’s a very rough paste. Rub a third of the mixture under the skin and another third inside the cavity. Take a large casserole pot, such as a Le Creuset style one, and place the bird inside it. Don’t worry if it is very tightly packed. Alternatively, you could use a large enough bowl. 3. Pour over the melted butter and rub it under the skin and all around the chicken. Throw over the buttermilk and add the remaining third garlic and black pepper mix. Rub that in too. 4. Cover with cling film and, ideally, place in the fridge for between two-four hours, depending on how hungry you are but overnight is beautiful. This will allow the buttermilk to work its magic, tenderising the chicken, and keeping it moist after cooking. 5. When you’re almost ready to cook, remove the pot from the fridge, while you pre-heat the oven to about 150ºC. 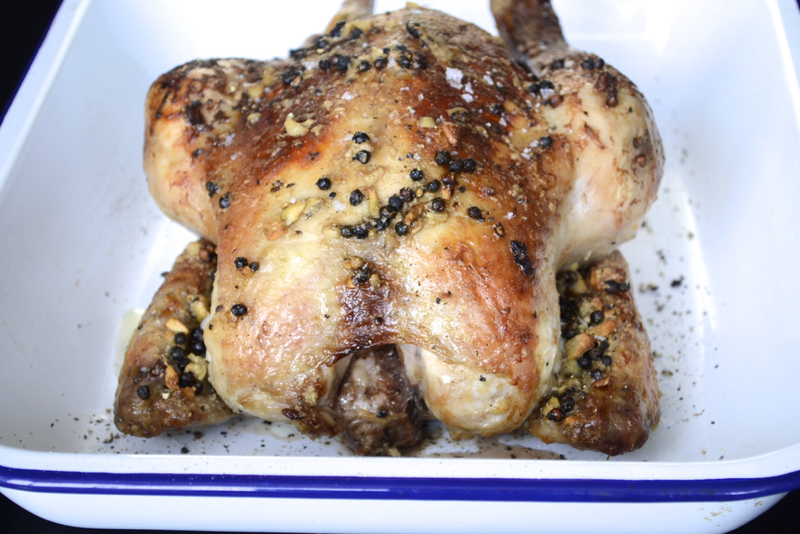 Place the chicken in a roasting tin, suitable for its size, and pour out the marinade – it’s not needed anymore. 6. Roast for about 1hr 40mins, basting with any liquid in the tin every so often. Then hike the heat to 200C for 15 minutes, just to help crisp up the skin. Remove from the oven, and leave to rest under tin foil for at least ten minutes, if not 20. We recommend you serve this with spicy, homemade potato wedges and fresh coleslaw, or keep it traditional by doing roast potatoes, sprinkled with cayenne pepper. Next Post Could The UK Actually Do Alright In The Eurovision?